Hallam CC's Richard Storer (right) wins Lifetime Achiever OSCA. Richard joined Hallam Cricket Club in 1984 and, from day one, put his heart and soul into the club. In 1987 he became club secretary, a post he has now held for 30 years. As secretary, Richard’s drive has seen the club expand from two senior and three junior teams to five senior teams, fourteen junior teams, two Last Man Stands sides, a joint women’s team and a very successful indoor team. The successful expansion of teams has lead to the club now operating across three grounds. Richard’s determination and willingness to pick up the baton to make things happen has been key to this success. His determination has helped take the club through Clubmark and he was instrumental in the redevelopment of derelict land to help create the club’s second ground. As well as serving as club secretary, Richard has also run a number of junior teams. Currently, this includes the U9s, U13s & U15s. Richard’s commitment to grass roots cricket has lead to his involvement in city junior representative sides and to becoming an active member of the league committee. 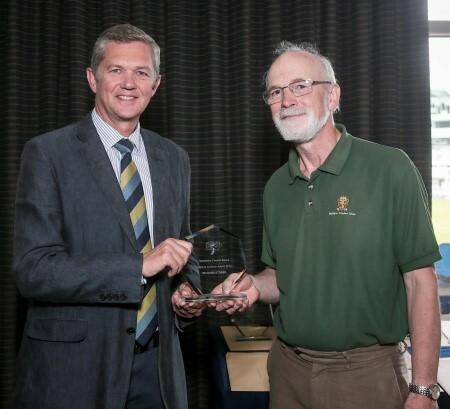 Richard has served Hallam Cricket Club for 30 years through which the club and cricket in Sheffield have benefited equally from his passion, enthusiasm and selfless hard work. A huge well done to Richard on his great work!